Ottawa-Glandorf’s Wes Davidson heads for home as Wapakoneta’s Cooper Talowsky awaits the throw during Tuesday’s game at Wapakoneta. 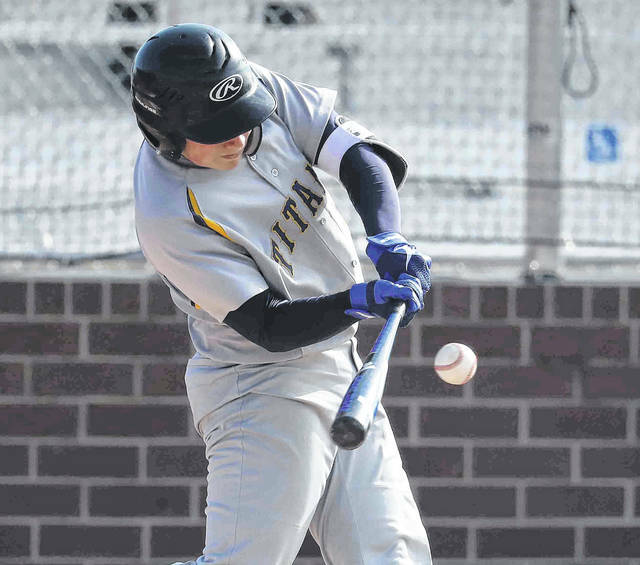 Wes Davidson bats for Ottawa-Glandorf during Tuesday’s game at Wapakoneta. Wapakoenta’s3 Nate Ambos fields a ground ball during Tuesday’s game against against Ottawa-Glandorf at Wapakoneta. 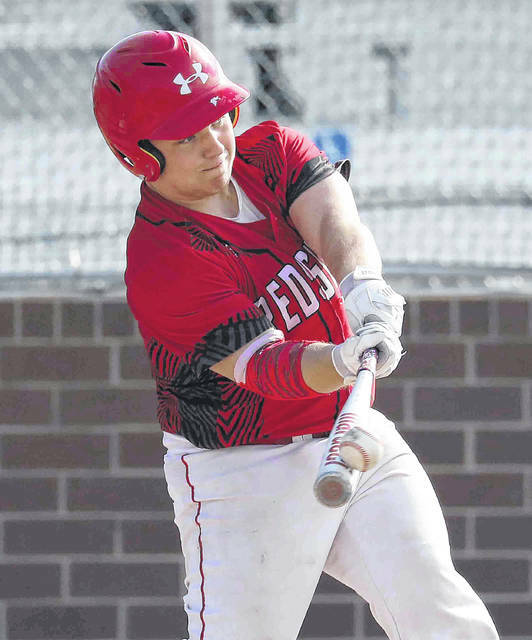 Cooper Talowsky bats for Wapakoneta during Tuesday’s game against Ottawa-Glandorf at Wapakoneta. Wapakoneta’s Jett Makar collides with Ottawa-Glandorf’s Ethan Alt at home plate during Tuesday’s game at Wapakoneta. Makar was called safe on the play. 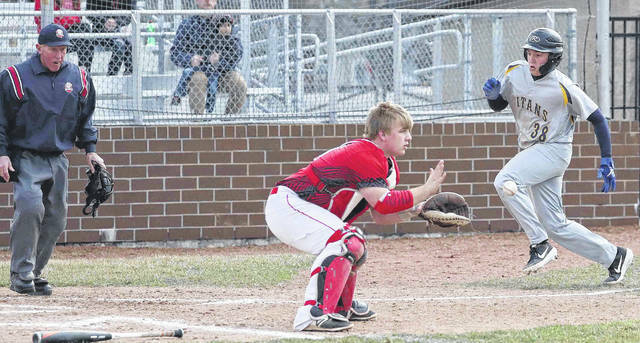 WAPAKONETA — Both teams were in need of a pitcher who could throw strikes. Then, in came Wapakoneta’s Tim Bruns to show the way in the fourth inning. 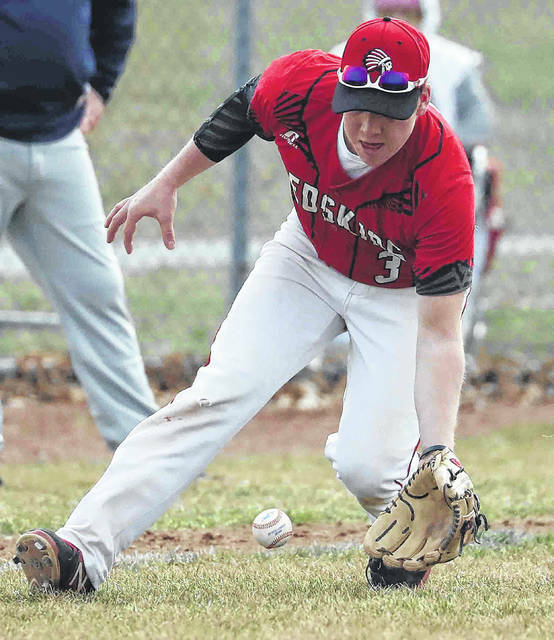 Bruns slammed the door on Ottawa-Glandorf and helped the Redskins post a 3-2 victory Tuesday over O-G. The game featured 16 total walks, including 10 by O-G pitchers. That’s why Bruns’ effort stood out. Bruns, a junior right-hander, threw the final 3 1/3 innings shutout innings for the win. He gave up one hit and one walk. He struck out three. Wapak is 3-2, 1-0 in the WBL. O-G is 2-2, 0-1 in the WBL. 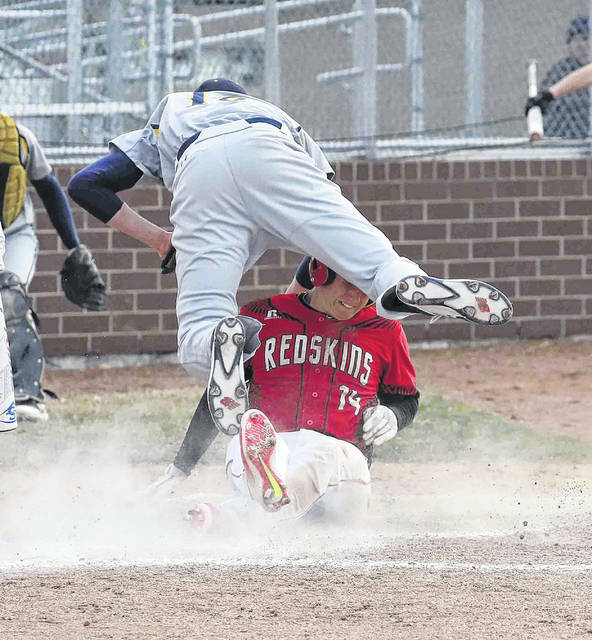 Wapak’s Trevor Crow had the Redskins’ only hit and it was the game-winning hit. He delivered a two-out RBI double off reliever Jacob Balbaugh in the home fifth inning. That gave Wapak a 3-2 lead. For Bruns, it was his second strong outing of the year. The junior made his first-ever varsity pitching performance last week in a 2-1, six-inning loss to Ben Logan. He followed that up with his outing against O-G.
Bruns pounded the strike zone with his big, breaking ball and fastball. Bruns continually got ahead in the count. He finished it with a 1-2-3 seventh inning, with two strikeouts. O-G had plenty of chances, but the Titans left 10 on base. The Titans also hit several balls hard, but Wapak shortstop Jett Makar made several outstanding plays up the middle. “That’s baseball and their shortstop made many great plays that probably won them the game,” O-G coach Nick Miller said. “We hit a lot of balls up the middle that I thought were going to get through, but he played that middle really well. Wapak took 1-0 lead in the second when Garrett Siefring walked with the bases loaded. That was O-G starter Ethan Alt’s fourth walk of the inning. Alt was taken out with a no-hitter after 2 2/3 innings. While he didn’t allow a hit, he walked eight and struck out six. O-G tied the game at 1 in the third. Wes Davidson and Trey Nienberg both singled. Davidson scored on Logan Miller’s RBI single. The Redskins took a 2-1 lead in the third when Jett Makar scored from third on a wild pitch. Balbaugh scored from third on a wild pitch for O-G to tie the game at 2 in the fourth. After Wapak starter lefty Brady Erb walked two straight in the fourth, he was lifted with two outs in favor of Bruns. In the home fifth, Bruns led off by being hit by a pitch. Braden Goulet walked. Then, with two outs, Crow hit an RBI double in the left-center field gap to score Bruns with the go-ahead run. Bruns is wearing jersey No. 16 for his friend, Manny Vorhees, who wore it last year as the Redskins’ standout pitcher, who helped the Redskins to the Division II state championship game. Vorhees is now pitching at Ohio Dominican. This entry was tagged ottawa-glandorf, Wapakoneta. Bookmark the permalink.